The Database Deployment Toolkit provides access to the deployment classes through out the StrataFrame class library. A GUI has been provided for developers who do not have a need for a programmatic interface. The Database Deployment Toolkit creates the database structures on the SQL Server using SMO (SQL Management Objects), circumventing the need for scripts. 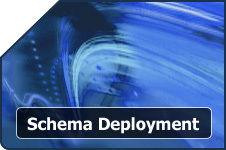 Identical processes are used for initial data deployment or when a database schema is simply being upgraded. The Toolkit will analyze the status of a particular database and determine whether a current structure should be migrated forward or in the case of its absence, created. When using scripts for deployment, they must be written in T-SQL code and are very lengthy procedures that are written to a specific version of a data structure. This means that if an end-users database is being updated, each script must be run in a proper sequence otherwise the data structure can be compromised and cause data loss. StrataFrame uses SMO which is completely managed code which allows all of the Database Deployment Toolkit engine logic to be written in .NET. Moreover, the engine of the Database Deployment Toolkit has the intelligence to migrate an end-users database from version 1 to version 3, for example, in a single step. In addition to the process only taking a single step, any field, table, or database renames will maintain the existing data. When a structure is packaged through the Database Deployment Toolkit editor, it creates a single package file. This file contains every piece required to deploy every aspect of a data structure including the static deployment data. This makes deployment of SQL Server database structures very easy and makes the deployment process simple for the developer. Most applications have the need to include certain pieces of data when deploying a database to the end-users server. An example of this may be postal codes, states, countries, and so on. The Deployment Data feature within the DDT provides a complete data deployment solution. When the package is built, it will dynamically pull in the deployment data based on the specified parameters. The deployment process is handled through the use of several classes within the StrataFrame class library. These classes are exposed to allow a developer to use them in any scenario where they are needed. They can be used within an InstallShield setup program or other setup utilities or used in conjunction with a user interface written by the developer. The deployment is threaded and several events are provided which allows the developer to show progress throughout the deployment. The Database Deployment Toolkit is optimized for SQL Server 2005 and provides extended support for such features as Query Notification Services. However, it is completely compatible with SQL Server 2000 as well. SQL Server versions prior to SQL Server 2000 are not supported at the deployment level. Automatic Type conversion is a very useful and powerful features. This allows all profiles to be created using data types that are optimized for SQL Server 2005. So all meta-data will be designed in the latest version of SQL Server. However, if the SQL Server 2005 optimized meta-data package is deployed to SQL Server 2000, the Database Deployment Toolkit automatically converts the data types to the equivilent 2000 data type. For example, if a VarChar(MAX) field was deployed to a SQL Server 2000 database, it would automatically be converted to a Text data type. A user interface has been provided for use as a stand-alone application and for use within the Database Deployment Toolkit’s meta-data editor. The GUI gathers necessary server and login information from the user before deployment and displays the progress while creating a log of the process.